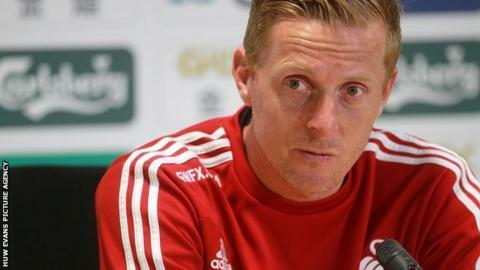 Swansea City head coach Garry Monk has targeted consecutive league wins for the first time since 2012. Victory over Aston Villa would give the Swans back-to-back league victories for the first time in 58 games. Swansea have not won back-to-back games in the Premier League since the victories over Arsenal and West Bromwich Albion in December 2012. "It has been well over a year since we got back-to-back league wins, and that is unacceptable," Monk said. "If you want to do well in the league we are in, that can't happen. It has been far too long. "It is a massive stat for us. It's simply not good enough that we have not won back-to-back games for so long and it's something we need to change." Monk's side are six points clear of the relegation zone following last Saturday's 2-1 win at Newcastle United with Saturday's opponents Villa a point behind. The Swansea boss believes there is still work to be done with two games of the season remaining after Saturday's game at the Liberty Stadium. "We all know how much the Premier League means to the club and everyone involved," Monk added. "We worked so hard to get here, and we have been here for a little while now. "We are not there (safe) yet. We've got work to do, and no game is easy, especially this time of the season. "Everyone is scrapping for their lives, and Aston Villa are still scrapping to try to secure their safety. "They are a young side, very energetic, and it is not going to be an easy game at all for us."